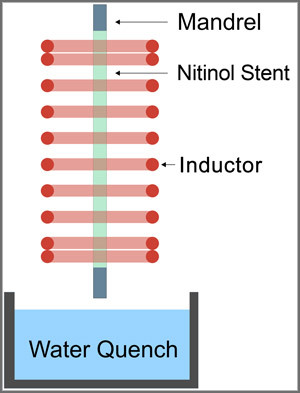 Heat setting medical stents on mandrel to set proper size is the objective of this induction heating application. 1kW RF power supply and a .66 microfarad heat station, 9 turn round inductor (coil), fixture to hold 5 x 150mm mandrel, AE optical pyrometer, water quench tub. This heat treating process required very precise temperature control. The temperature could not very over 2 degrees along the length of the mandrel. The stent was slid onto the mandrel and the mandrel placed into the inductor. The power was set to ramp up to 510°C in 2 minutes so that the temperature across the mandrel remained relatively even. As set point temperature is reached, the mandrel was held for 2 to 3 minutes. The part was then removed from the inductor and quenched in water. The stents heated very well on the mandrel. The ramp up rate was minimized to 2 minutes to avoid over heating at the ends of the zones. After the mandrel/stent was quenched, the stent would easily slide off the mandrel by itself.